This article is about the type of vehicle. For the sample course from Super Mario Maker, see Airship (level). An Airship is a large, propeller and Burner-driven ship that can soar through the sky. Airships are most commonly equipped with cannons, Bullet Bills and Bob-ombs. One airship, featured in New Super Mario Bros. Wii, Super Mario 3D Land, and New Super Mario Bros. U is commonly used by Bowser, Bowser Jr. and the Koopalings, and Princess Peach is usually kept captive here until Mario and his friends storm the airship late in the game, at which point she gets taken away to Bowser's Castle. An Airship taking off in the Super Mario All-Stars version of Super Mario Bros. 3. Artwork of an Airship in Super Mario Bros. 3. The artwork depicts Peach being captured by the Koopalings, even though Bowser only captured her in-game after all the Koopalings were defeated. 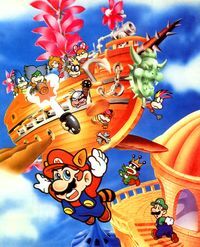 Airships first appear in Super Mario Bros. 3, where several of them are used by the Koopalings in their invasion of the Mushroom World. Gameplay-wise, they represent the last level of each world (except for Dark Land), flying above the king's castle. In these levels, Mario or Luigi must avoid the heavy artillery and Rocky Wrenches to reach the main cabin, where the Airship's captain is fought. If Mario or Luigi fails to clear the level, the Airship flies away to another location on the world map, unless it is weighed down by an Anchor. After the magic wand is secured, the Airship vanishes, and Mario falls down into the castle and gives the scepter back to the king. Bowser's air force: brown ship with a black background. These were changed in the remakes, which depict them with the standard brown color as well as a stormy background (and in the case of the cutscene where Mario boards the airship, using the background for the final Tank level in Dark World). Similarly, the interior of the Koopalings' airships as well as the Treasure Ship has a randomly-assorted stack of wooden blocks in a dark background (only the Airship level of World 8 is exempt, as it is completely pitch black in terms of background), though the remakes change it to a background with stormy windows (or in the case of the Treasure Ship, calm dark windows). Land-based counterparts to these vehicles, tanks, also debut in this game. Although not an actual airship level, one part of the Super Tank level of Dark Land has three floating wooden objects up top that could suggest airships. Bowser's air force is composed of either 18 aircraft (NES and SNES versions) or 15 aircraft (GBA version), including one cargo loader and a command ship manned by Boom Boom. In page 34 of the manual for Super Mario Bros. 3, Lemmy's character quote mentions that he heard that his father, Bowser, was creating new weapons, although they are not specified. It is likely that these weapons are the small airships, the tanks and battleships.. Similar to Airships, Treasure Ships can be found in Super Mario Bros. 3 after finishing a level with a coin total that is a multiple of 11, the tens digit in the score matches this number and the last digit on the timer is an even number, which causes a Hammer Bro on the world map to transform into a Treasure Ship. The music used on these Airship stages is later remixed and used in Paper Mario, Super Mario Galaxy, New Super Mario Bros. Wii and Super Mario 3D Land. It is also an available track in Super Smash Bros. Brawl. The tune appears to be based on "Mars, the Bringer of War" from Gustav Holst's "The Planets" suite. Besides their appearance in the main game, the GBA remake of Super Mario Bros. 3, Super Mario Advance 4, has them appear in four e-Reader levels: Airship's Revenge, Armored Airship, Bowser's Airship 1 and Bowser's Airship 2, where they are piloted by Morton Koopa Jr., Lemmy Koopa, Boom Boom and Bowser, respectively. Of the four Airship e-Reader levels, Airship's Revenge was the only one of the four that was playable in the English version after the e-Reader's discontinuation in its original release. However, the Virtual Console version for the Wii U eventually included all the e-Reader levels. In Super Mario World, a crashed, ruined Airship from Super Mario Bros. 3, named the Sunken Ghost Ship, can be explored in Soda Lake. It is haunted with Boos and filled with water. Completion of this sunken Airship is necessary to unlock the Valley of Bowser's entrance. There are a few Bill Blasters that are functional. It is the only level in the game where a Magic Ball can be found. 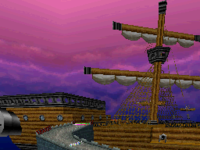 In Super Mario 64 and Super Mario 64 DS, an airship known as the Rainbow Cruiser appears in Rainbow Ride. Wind blows there, and a Lakitu, Bob-omb, and Goomba appear aboard it. In one mission, Mario (in Super Mario 64) or Metal Wario (in Super Mario 64 DS) must grab a Star on this Airship. This same ship is featured in the Super Smash Bros. series within the stage Mushroom Kingdom: Rainbow Cruise, a stage based on Rainbow Ride. This Airship is also later seen in Mario Party, housing the Luigi's Engine Room board. Its rather aberrant design, with oar-like wings protruding out the bottom, appears to be based on a Japanese advertisement for Super Mario Bros. 3. There is an Airship that appears in a minigame called Bob-omb Squad that flies around and deliver Parabombs, as well as appearing in a minigame called Balloon Racing. It appears to be the Goal for the Yoshis. Two Airships that appear in Super Mario Galaxy. A model of Bowser Jr.'s Airship from Super Mario Galaxy. In Super Mario Galaxy, Bowser and his Koopa Troop attack Princess Peach's Castle with Airships. Later in the game, Mario has to fight enemies on Airships. There are three Airship stages. In the Good Egg Galaxy, two Airships are commanded by King Kaliente. In the Space Junk Galaxy, a larger group of Airships are led by Kamella. Finally, an entire fleet of Airships is commanded by Bowser Jr., who also rides one throughout the game. There are also Airships in the background of Gateway Galaxy, and Bowser's Star Reactor, however these are not accessible without hacking. Airships appear during the opening and closing cutscenes of Bowser's Galaxy Reactor. While traveling to the center of the universe, the Comet Observatory smashes through several airships guarding Princess Peach's Castle. Later, the remaining airships are sucked into the supermassive black hole, along with the observatory and the castle. In this game and subsequent games, the Airships have been redesigned to resemble naval galleons, similar to how they appeared in the Super Mario Bros. 3 artwork. These galleons have few decks for Mario to explore, unlike the original sprawling, side-scrolling Super Mario Bros. 3 airship levels. They also have doors that cannot be opened, but spinning next to them yields a Coin. There is a looped version and an unlooped version of the airship theme in Super Mario Galaxy. The looped version plays in the airship level in Space Junk Galaxy and Bowser Jr.'s Airship Armada, and the unlooped version only plays in the opening where the airships appear and attack the Mushroom Kingdom. The unlooped version has an intro where small instruments play, followed by more instruments, and finally the whole orchestra. World 8 airship in New Super Mario Bros. Wii. An Airship from New Super Mario Bros. Wii. 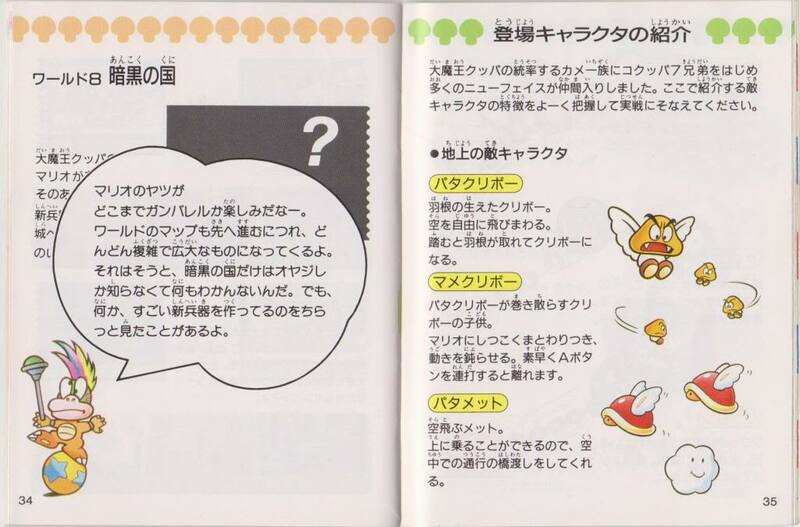 An airship (also known as a Sky Ship in the Prima Games guide) also appears in New Super Mario Bros. Wii, where Bowser Jr. and the Koopalings use it to escape with the kidnapped Princess Peach. This resembles the airship Bowser uses in the opening sequence of Super Mario Galaxy. Mario and his friends end up chasing it throughout the game, with the airship dropping one of the Koopalings off at the world's tower. Upon defeating the Koopaling at the castle at the end of each world, Mario and company walk outside to see Bowser Jr. boarding the airship and taking off, with Peach crying for help from the deck. In Worlds 4 and 6, however, Bowser Jr. gets left behind by the airship, and he gets chased back into it by Mario and the gang, who board it as well and fight Bowser Jr. at the end, only for them to be dumped outside to continue the pursuit. With the airship no longer present in the world, an anchor is seen in its place on the map and level preview screen. Finally, at World 8, Magikoopa is sent out to the tower to stop the heroes while the airship flies to the end of the world by itself with no castle in sight. Upon his defeat, Magikoopa returns to the airship, which Mario and his friends subsequently board by themselves. After one last battle with Bowser Jr., Mario and friends finally find Peach on the deck, but Magikoopa intervenes and steals her away. Their goal now relocated to Bowser's Castle, Mario and company abandon the airship for the remainder of the game. The airship's general appearance stays the same throughout the game, yet each time the heroes fight Bowser Jr., it is completely different on the inside. An Airship from Super Mario Galaxy 2. Airships make a minor appearance in Super Mario Galaxy 2. In Bowser Jr.'s Fearsome Fleet, two Airships come out of Wormholes (the second of which has a Hammer Bro, a Comet Medal and a Green Star). At the end of Fleet Glide Galaxy, Airships appear and shoot Bullet Bills and Cannonballs at the player. An Airship in Super Mario 3D Land. Airships appear in the Nintendo 3DS game Super Mario 3D Land. One of these vehicles are owned by Boom Boom and Pom Pom. They come with new features such as Skewers added. After defeating Boom Boom or Pom Pom in the airship, the player has to keep walking to the Goal Pole instead of ending the level immediately after defeating the boss, as in previous games, as these bosses actually disappear, leaving their coins behind and a Warp Pipe appears. In some of the levels of the secret worlds, the Airships simply require that the player reach the goal, with only one Airship level having Boom Boom and Pom Pom as mandatory bosses (although in another Airship level, the player can fight Boom Boom by accessing a pipe, the fight on that level is completely optional and only acts as a shortcut to the other ship barring somersaulting through a brick barrier). In a manner similar to the Airship's appearance in New Super Mario Bros. Wii, the Airships in the starting cutscenes looked generally the same, but during the gameplay levels, they looked completely different. The Prima guide refers to Airships as simply Ships. A single airship level appears in World 5 as a golden ship similar to the Treasure Ship in Super Mario Bros. 3. It is named World 5-A and, like every other level, has three Star Coins; it also has a secret exit reached via beanstalk. However, unlike other Airships in the series, this one does not end with a boss. Airships return in New Super Mario Bros. U. This time, every Koopaling and Bowser himself has a personalized airship, with the former seven having their faces on the bow, and their shells on the top and each having specific designs (e.g. Morton's airship being the biggest airship of the seven, while Iggy's is the thinnest and fastest airship, and Roy and Morton's airships also have 2 cannons). The latter has the same airship featured in New Super Mario Bros. Wii, with painted Bowser faces on the bow and the stern as well as the addition of a large mechanical hand, which Bowser uses to throw Mario, Luigi, Yellow Toad, and Blue Toad all the way to Acorn Plains. The Koopaling's boss battles take place inside their airships (or in the case of Roy Koopa and Ludwig von Koopa, on the crow's nest of their airships) and the player must use a cannon to shoot their way in there. After the player defeats a Koopaling, Mario jumps onto that Koopaling's airship, causing it to smoke, go out of control and finally crash. Boarding the Airship of New Super Mario Bros. U.
Bowser's flagship is used as a setting for two courses. Like in Super Mario Bros. 3 and Super Mario 3D Land, they are auto-scrolling levels with Bowser Jr. fought in the end. The first time is in the beginning of Soda Jungle, in The Mighty Cannonship, which takes place on the deck, then the underwater cabin and ends with a boss fight against Bowser Jr. in a submarine Junior Clown Car. The second time is at the end of Meringue Clouds, right after Ludwig's Clockwork Castle. Unlike the other airship courses in the series, Boarding the Airship starts on the ground, working its way up to the bottom of the airship, to a boss fight with Bowser Jr. in his armed Junior Clown Car. At the very end of this course, Bowser Jr. accidentally damages the flagship and crashes it right outside Peach's Castle and remains there until the game is completed. The flagship appears one more time in the ending, patched up and sputtering, as the Koopalings and Bowser Jr. use it to escape. It eventually crashes into a hill because of Bowser jumping aboard and his weight bringing it down, completely destroying it. Airships are an unlockable level theme in Super Mario Maker and Super Mario Maker for Nintendo 3DS, and returns in Super Mario Maker 2. For Super Mario Maker, new airship level themes and music have been made for the Super Mario Bros. and Super Mario World styles, since airship levels first appeared in Super Mario Bros. 3 and did not properly appear in Super Mario World (the only airship is the Sunken Ghost Ship, a mostly underwater stage). In the Super Mario Bros. style, the course elements appear to be metallic (consistent with the original game's color limitations), while in other styles the elements are wooden and have ropes. Bowser's Flagship, now colored white and purple and heavily decorated, appears in Super Mario Odyssey. The airship has undergone a small redesign, now sporting propellers on the sides below the cannons, sails, what appear to be Power Moon tanks and a variety of smaller embellishments. Rather than the usual theme, the new airship theme from Super Mario Maker for the Super Mario Bros. style plays during scenes in which it flies away. Additionally, the Broodals are seen using a white-colored airship similar to the airships used by the Koopa Troop, but with the bust of Madame Broode at the front. Many residents of the Cap Kingdom have airships of their own, which can be found crashed early on. In addition, Mario himself has an airship of his own called the Odyssey. Although airships themselves do not appear in their usual form, the Axem Rangers' ship Blade has a similar role to airships, only in this case being the boss arena for the Axem Rangers at Barrel Volcano (and to a certain extent, a boss in his own right). Although the Airships used by the Koopa Troop themselves do not appear in Game & Watch Gallery 2, a similar flying ship appeared in the Modern version of the game Parachute. In Game & Watch Gallery 4, one of the stages in the Modern version of the game Donkey Kong involves an airship. The Rainbow Cruise stage featured in Super Smash Bros. Melee and Super Smash Bros. Brawl included the Super Mario 64 airship; it is the beginning platform in these stages and carries players left until it hits a platform-filled area and sinks, only to be generated again later as the automatically-scrolling stage loops back to its beginning. Of note is that this interpretation of the Rainbow Ride airship is actually more airship-like than the original one, while Super Mario 64 showed it to only have wings keeping it afloat. The Super Smash Bros. series also gives it the propellers common on traditional Airships. Additionally, a remix of the Super Mario Bros. 3 airship music can be selectable for the Luigi's Mansion stage in Super Smash Bros. Brawl. In Super Smash Bros. for Wii U and Super Smash Bros. Ultimate, on the Mario Galaxy stage based off of the Super Mario Galaxy games, an airship from said games can be seen flying above the stage. 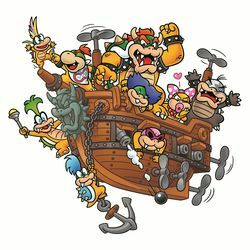 While airships are largely absent from the Mario & Luigi series, the Koopa Cruiser seems to be Bowser's personal airship in Mario & Luigi: Superstar Saga and Mario & Luigi: Partners in Time. It is quite different from the other airships in the Mario games. In Mario & Luigi: Dream Team, Shy Guys are seen using miniature airships known as "Airtubs". The airtubs make minor appearances in Mario & Luigi: Paper Jam, attacking Peach's Castle alongside Neo Bowser Castle and airlifting Toadette's Papercrafts. Papercraft Airships also appear during the Papercraft Bowser boss fight, firing Papercraft Bullet Bills at Papercraft Fire Mario. In Dance Dance Revolution: Mario Mix, the SS Brass is an airship. Toad and Mario (or Luigi) travel around the Mushroom Kingdom searching for the Music Keys in it. It also doubles as a normal sea going ship in the second world. The Airship seen in Mario Kart DS. In Mario Kart DS, the race course Airship Fortress appears in the Star Cup and partially takes place on an Airship, which is in the midst of attacking a collapsing fortress. Like the Airships of Super Mario Bros. 3, the Airship portion of Airship Fortress track is filled with Rocky Wrenches, Bullet Bills and Rocket Engines. Also of note is that more of the inner workings of Airships are seen in this game; the explored Airship features, in addition to the deck, are a storage room, a boiler room and a very large cannon. In Mario Kart 7, Airship Fortress from Mario Kart DS reappears as the third track of the Lightning Cup. A kart body named Landship, modeled after an airship, appears in Mario Kart 8 and Mario Kart 8 Deluxe. When used by the Koopalings, its stern and cannon lids change color to match their own airships in New Super Mario Bros. U.
Airships also appear in Cloudtop Cruise, with one of them used as a part of the track, Bowser's Castle, in the background during one of the zero-gravity sections, and in GCN Baby Park as a spinning ride seen in the background of the course. Luigi's Engine Room, from the first Mario Party, takes place inside of an airship as shown during the ending. In Mario Party 6, Bowser makes a reference to airships when the player gets a Cursed Mushroom panel in Speak Up. Airship Central from Mario Party 10 takes place across a fleet of airships and clouds. Bowser's flagship appears during the second and third parts where it fires at the players in the former and is destroyed in the latter. The flagship also appears in the background of the Bowser Board during amiibo Party. The Flying Krock in Donkey Kong Country 2: Diddy's Kong Quest. In the Game Boy game Donkey Kong Land, two blimp levels appear in the area Big Ape City. The first is Kong Krazy, which is the second level of the area. Here, the Kongs must collect K-O-N-G Letters which form bridges across wide abysses found in the level. The second blimp level is Fast Barrel Blast, which consists of many wide pits and high ledges. These must be crossed using barrels and tires. The final battle, K. Rool's Kingdom, also takes place within a blimp. The levels' backgrounds consist of metal panels, pipes and machinery. The interior of The Flying Krock; it is stocked with a large amount of bananas and barrels. 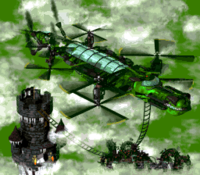 In the games Donkey Kong Country 2: Diddy's Kong Quest and Donkey Kong Land 2, the The Flying Krock is an airship-like area which resembles a crocodile shaped helicopter. Kaptain K. Rool used this ship to kidnap Donkey Kong, and escape to the top of Crocodile Isle. The Flying Krock area contains two levels. The first is Screech's Sprint, where the Kongs must race Screech to the finish line. The second level is the boss battle against Kaptain K. Rool. The King Kruiser IV, as it appears in DK: Jungle Climber. In the game DK: King of Swing, an airship known as the K. Kruizer III is used by King K. Rool. It is the setting for the final world of the game. K. Kruizer III Artillery is the second level, which moves through the weaponry areas stocked by the K. Kruizer III. Completing this allows progress to the hull of the airship, which contains many conveyor belts, spikes, mines, and barrels. Later, the engine of the airship is featured as the final level before facing King K. Rool. In DK: Jungle Climber, an airship appears as the King Kruiser IV. It resembles a crocodile, and is heavily armed. In the latter stages of the game, the Kongs chase the King Kruiser IV to High-High Island. However, they miss the ship as it passes over the top of the island. In the level Space A Go-Go, Donkey Kong travels out of Planet Plantaen, chasing down the King Kruiser IV. Donkey Kong enters it through a small opening guarded by Kritters. The interior appears similar to the factory-themed levels found in the game. The Kongs chasing an Airship manned by a Tiki Pilot. In Donkey Kong Country Returns and the 3DS remake, the Tikis use Airships controlled by Tiki Pilots as transport and getaway vehicles after stealing the Kongs' Banana Hoard. The Tikis also use these as weapons to bump into the Kongs while they ride Rocket Barrels. The Tikis even watch the battle with Thugly from an Airship. The Prima guide refers to these airships as Tiki Airships. In Super Mario Bros. & Friends: When I Grow Up, airships briefly appear on the Armed Forces Pilot career page. Mario is having a "dogfight" with the airship. In Mario Hoops 3-on-3, Black Mage, White Mage and Ninja's court, the Rainbow Ship, is a large Airship adorned with various statues and a large basketball court on it. It is based off the airships of Final Fantasy rather than the airships of Mario's World. Airships make a brief appearance in Mario Sports Mix. The Star Ship also resembles an Airship, as well as serving as a replacement to the Rainbow Ship. Boom Boom's intro in Mario Tennis Aces shows him descending onto the court from an airship's anchor, without the airship being seen. In addition, the boats that appear in Savage Sea heavily resemble airships from Bowser's armada, down to having propellers on their masts despite being exclusively used in sailing. An airship is flown by Bowser Jr. and serves as the basis for Bowser Jr.'s Flotilla in Paper Mario: Sticker Star. It features Banzai Bills shot out from Bill Blasters, Rocky Wrenches, Hammer, Boomerang, Fire and Ice Bros., as well as Bob-ombs. An airship is featured in Paper Mario: Color Splash, where it is first seen carrying a vat of red paint that is intended to be delivered to Black Bowser's Castle. However, Mario manages to infiltrate the airship by climbing the anchor a Shy Guy forgot to lift. The Airship eventually gets destroyed right above Crimson Tower when Mario hits a self-destruct switch. The airship later returns after Black Bowser reveals himself, albeit in a severe state of disrepair. Bowser escapes with it upon revealing his role in the disaster in Prism Island, also revealing he has abducted Princess Peach. The airship is seen one last time during the ending, where the Koopalings and Bowser, who is tethered to the same string of tape he used to hold Peach to the ship, use it to leave the island. Similarly to the ending for New Super Mario Bros. U, the airship ends up being forced to crash land off screen after sustaining extreme damage again (in this case, from being hit by a stray firework) as Peach, Toad and Mario watch. Airships are the last level of every world in Puzzle & Dragons: Super Mario Bros. Edition. They are actually the Koopalings' airships and have their New Super Mario Bros. U design. Bowser's Doom Ship from The Adventures of Super Mario Bros. 3. A single Airship, owned by King Koopa and only ever referred to as the Doom Ship, appears regularly throughout The Adventures of Super Mario Bros. 3. Like its game counterparts, the Doom Ship is equipped with a large amount of artillery and also possesses a trait not seen in any games featuring Airships: the ability to teleport to other locations. According to the bonus disc on the Shout! 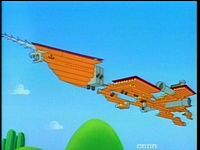 Factory DVD set, the Doom Ship was built by Kooky von Koopa. In Nintendo Comics System, an Airship makes an appearance in the issue Mutiny on the Fungi, which has Bowser and his crew of Koopa Troopas and Mushroom People using it to steal various treasures. The Doom Ship reappears in two Nintendo Adventure Books. In Double Trouble, Luigi is held captive on the Doom Ship by Roy Koopa, but he can be rescued by Mario, who can also hijack the Doom Ship and use it to travel to Fort Koopa in the Koopahari Desert. In Leaping Lizards, Iggy has possession of the Doom Ship and first appears with it after Morton signals him for backup after being confronted by Luigi, though upon sighting the plumber, the cowardly Koopaling abandons his brother out of fright. Luigi can choose to board the Doom Ship and, if he chooses to stay in hiding instead of trying to attack Iggy, is taken to the Koopaling's secret laboratory. In the Japanese and North American versions of Super Mario Bros. 3, the first part of the airship theme has its melody and percussion play at slightly different speeds, which leads to the percussion being cut off early as the second part begins. This is corrected in the European version but retained in Super Mario Maker. In the premade world for the Super Mario Mash-Up Pack in Minecraft, Airships can be found near the entrance to the Valley of Bowser. The airship theme in Super Mario Bros. 3 was arranged for Super Smash Bros. Brawl, Super Smash Bros. for Nintendo 3DS / Wii U and Super Smash Bros. Ultimate. On Super Smash Bros. Brawl and Super Smash Bros. for Wii U, it can be heard on the Luigi's Mansion stage. It can also be heard on the Super Mario Maker stage in Super Smash Bros. for Nintendo 3DS / Wii U and any stage related to the Mario series in Super Smash Bros. Ultimate. ↑ 「マリオのヤツがどこまでガンバレルか楽しみだなー。ワールドのマップも先へ進むにつれ、どんどん複雑で広大なものになってくるよ。それはそうと、暗黒の国だけはオヤジしか知らなくて何もわかんないんだ。でも、何か、すごい新兵器を作ってるのをちらっと見たことがあるよ。」 ("I'm looking forward to see how far can Mario go. As you advance the world maps become more complex and extensive. Anyway, our dad alone knows Dark Land and I have no idea about it. But I had glanced he had been making some great new weapons.") - Super Mario Bros. 3 Japanese instruction booklet, page 34. ↑ "How far can Mario go? I hope he doesn't make it this far. Dad has many complicated tricks waiting for him in the Dark Land. I've even heard about some new weapon that dad's been making." - Super Mario Bros. 3 English instruction booklet, page 34. ↑ Nintendo. Super Mario World manual, pg 20. ↑ Bueno, Fernando. New Super Mario Bros. Wii Prima Official Game Guide. Pages 11 and 18. This page was last edited on April 20, 2019, at 21:13.